Return on investment (ROI) is a financial ratioFinancial RatiosFinancial ratios are created with the use of numerical values taken from financial statements to gain meaningful information about a company. The numbers found on a company’s financial statements – balance sheet, income statement, and cash flow statement are used to perform quantitative analysis and assess a company's liquidity, leverage, growth used to calculate the benefit an investor will receive in relation to their investment cost. It is most commonly measured as net incomeNet IncomeNet Income is a key line item, not only in the income statement, but in all three core financial statements. While it is arrived at through the income statement, the net profit is also used in both the balance sheet and the cash flow statement. divided by the original capital costCapital ExpendituresCapital expenditures refer to funds that are used by a company for the purchase, improvement, or maintenance of long-term assets to improve the efficiency of the investment. The higher the ratio, the greater the benefit earned. This guide will break down the ROI formula, outline several examples of how to calculate it, and provide an ROI formula investment calculator to download. To learn more, Launch CFI’s Free Finance Courses! The first version of the ROI formula (net income divided by the cost of an investment) is the most commonly used ratio. 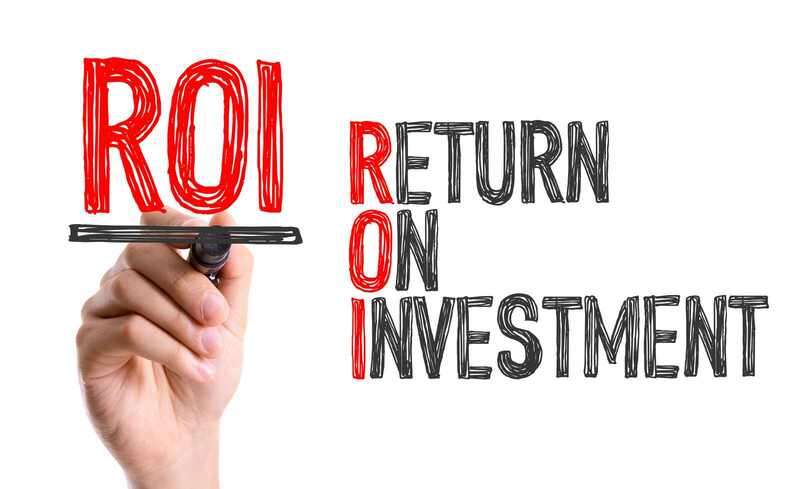 The simplest way to think about the ROI formula is taking some type of “benefit” and dividing it by the “cost”. When someone says something has a good or bad ROI, it’s important to ask them to clarify exactly how they measure it. An investor purchases property A, which is valued at $500,000. Two years later, the investor sells the property for $1,000,000. We use the investment gain formula in this case. To learn more, check out CFI’s Free Finance Courses! ROI calculations are simple and help an investor decide whether to take or skip an investment opportunity. The calculation can also be an indication of how an investment has performed to date. When an investment shows a positive or negative ROI, it can be an important indication to the investor about the value of their investment. Using an ROI formula, an investor can separate low-performing investments from high-performing investments. With this approach, investors and portfolio managers can attempt to optimize their investments. There are many benefits to using the return on investment ratio that every analyst should be aware of. The return on investment metric is frequently used because it’s so easy to calculate. Only two figures are required – the benefit and the cost. Because a “return” can mean different things to different people, the ROI formula is easy to use, as there is not a strict definition of “return”. Return on investment is a universally understood concept and so it’s almost guaranteed that if you use the metric in conversation, then people will know what you’re talking about. While the ratio is often very useful, there are also some limitations to the ROI formula that are important to know. Below are two key points that are worthy of note. A higher ROI number does not always mean a better investment option. For example, two investments have the same ROI of 50%. However, the first investment is completed in three years, while the second investment needs five years to produce the same yield. The same ROI for both investments blurred the bigger picture, but when the factor of time was added, the investor easily sees the better option. The investor needs to compare two instruments under the same time period and same circumstances. An ROI calculation will differ between two people depending on what ROI formula is used in the calculation. A marketing manager can use the property calculation explained in the example section without accounting for additional costs such as maintenance costs, property taxes, sales fees, stamp duties, and legal costs. An investor needs to look at the true ROI, which accounts for all possible costs incurred when each investment increases in value. To learn more, launch our free finance courses! As mentioned above, one of the drawbacks of the traditional return on investment metric is that it doesn’t take into account time periods. For example, a return of 25% over 5 years is expressed the same as a return of 25% over 5 days. But obviously, a return of 25% in 5 days is much better than 5 years! To overcome this issue we can calculate an annualized ROI formula. For example, an investor buys a stock on January 5th, 2017 for $12.50 and sells it on August 24, 2017 for $15.20. What is the regular and annualized return on investment? Download CFI’s free ROI Formula CalculatorReturn on Investment Excel CalculatorThis Return on Investment Excel Calculator will aid you in calculating the Return on investment for different scenarios. Return on investment is one of the most important profitability ratios to asses a companies performance. Here is a snippet of the template. Use this calculator to easily calculate the ROI when you h in Excel to perform your own analysis. The calculator uses the examples explained above and is designed so that you can easily input your own numbers and see what the output is under different scenarios. The calculator covers four different ROI formula methods: net income, capital gain, total return, and annualized return. The best way to learn the difference between each of the four approaches is to input different numbers and scenarios, and see what happens to the results. Below is a video explanation of what return on investment is, how to calculate it, and why it matters. You’ll learn a lot in just a couple of minutes! There are many alternatives to the very generic return on investment ratio. The most detailed measure of return is known as the Internal Rate of Return (IRR).Internal Rate of Return (IRR)The Internal Rate of Return (IRR) is the discount rate that sets the net present value of an investment equal to zero. This guide to calculating IRR will give several examples and who why it's used in capital budgeting, private equity and other areas of finance and investing. If IRR is greater than cost of capital, This is a measure of all the cash flow received over the life of an investment, expressed as an annual percentage (%) growth rate. This metric takes into account the timing of cash flow, which is a preferred measure of return in sophisticated industries like private equity and venture capitalPrivate Equity vs Venture Capital, Angel/Seed InvestorsCompare private equity vs venture capital vs angel and seed investors in terms of risk, stage of business, size & type of investment, metrics, management. This guide provides a detailed comparison of private equity vs venture capital vs angel and seed investors. It's easy to confuse the three classes of investors. Other alternatives to ROI include Return on Equity (ROE)Return on Equity (ROE)Return on Equity (ROE) is a measure of a company’s profitability that takes a company’s annual return (net income) divided by the value of its total shareholders' equity (i.e. 12%). ROE combines the income statement and the balance sheet as the net income or profit is compared to the shareholders’ equity. and Return on Assets (ROA)Return on Assets & ROA FormulaReturn on assets (ROA), a form of return on investment, measures the profitability of a business in relation to its total assets. 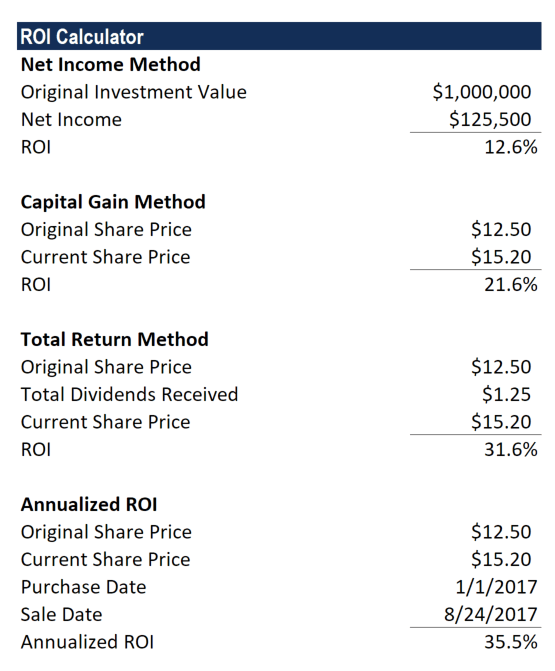 The ROA formula is used to indicate how well a company is performing by comparing the profit it's generating to the capital it's invested in assets. The higher the return, the more. These two ratios don’t take into account the timing of cash flows and represent only an annual rate of return (as opposed to a lifetime rate of return like IRR). However, they are more specific than the generic return on investment since the denominator is more clearly specified. Equity and Assets have a specific meaning, while “investment” can mean different things. Return on Equity (ROE)Return on Equity (ROE)Return on Equity (ROE) is a measure of a company’s profitability that takes a company’s annual return (net income) divided by the value of its total shareholders' equity (i.e. 12%). ROE combines the income statement and the balance sheet as the net income or profit is compared to the shareholders’ equity.